For the best calypso, reggae, soca and live steel drum music in the Tampa region, look no further than RythmTrail! 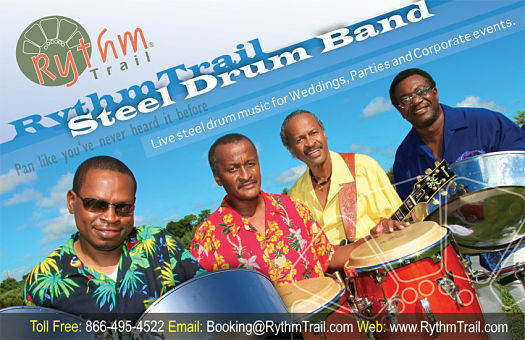 With over 20 years of experience playing steel drum music for beach weddings, business party and wedding receptions, RythmTrail is ready to provide your next event with the lively sounds of steel drums and soothing island music that’s perfect for any family gathering, beach party or corporate event. Whether you need a complete steel drum ensemble or a single solo performance from a live steel drum player, RythmTrail can provide you and your guests with the perfect beach-themed music for your gathering, party or event. RythmTrail will play your favorite song list per your request or let RythmTrail choose a selection of their own songs for the perfect beach wedding in Tampa Bay! If you’re on the beach in Tampa Florida or you’re across the planet in another country, RythmTrail is ready to play all of the best steel drum music for your next event. Give RythmTrail a call today at 866-495-4522 or get your free quote online and make your next party one you and your guests are sure to remember for years to come. Egypt Lake-Leto FL, Temple Terrace, Lake Magdalene, Mango, Brandon, Citrus Park, Bloomingdale, Oldsmar, Lutz, Safety Harbor, Pinellas Park, Saint Petersburg, East Lake, Dunedin and Largo Florida. Thoroughly enjoyed having Ephraim from Rythmtrail Steel Drum play at our Christmas party last night! It was our annual office party – backyard, evening, tropical setting. The music this year was the best ever!! We had nearly 40 guests with a wide variety of musical tastes but the wonderful variety and sound of Rythmtrail absolutely appealed to everyone!! Just perfect – thank you, Ephraim, for making the evening memorable! I heard your music was amazing…sorry I was not outside, but my guests said it was fun. Everything was great and the client was extremely happy, thank you! Lilly Pulitzer Store today, Tampa FL. form 12 noon to 3 PM. Shop to live steel drum music the Caribbean sound. We are jammin at Lilly Pulitzer Store today Nov 5 2016, Tampa FL. form 12 noon to 3 PM. Shop to live steel drum music, Caribbean sounds. Our steel drum band will be playing at Riverwalk, Tampa Convention Center for opening night reception of the FVMA convention in Tampa Florida. Apr 9 2016 steel drum band event update. Tonight we will be jammin at Davis Island Yacht Club for a Fundraiser Event. The best steel drum players in Tampa FL. Tomorrow Mar 12 2016 our steel drum player will be playing at Lilly Pulitzer Store in International Plaza Mall for a store promotions event. Come by and stop to the sounds of the Caribbean Islands, sweet steel drum music. Hire the best steel drum band in Tampa Florida for parties, beach weddings and corporate functions.